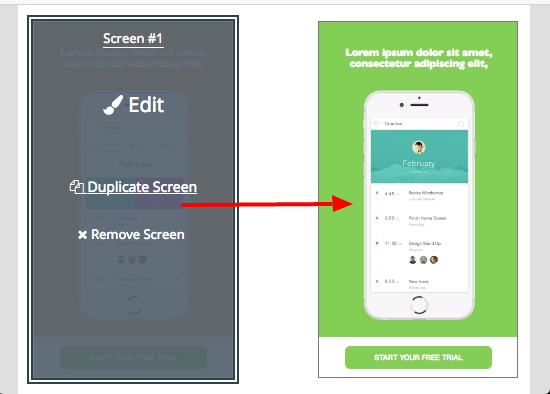 How to create the "Colorful Screens" template? Screen 1: All the images that we have chosen for this screen came from the assets that we have created. You should upload your images and choose the color that best suits your experience. For the sake of this article, you can access our gallery and choose the images from this experience in order for you to become acclimated to the platform. The very first element that is placed on the screen is a &apos;Shape Element .&apos; We labeled the shape element as New Overlay. We stretched the element to cover almost the entire screen. For this screen we chose rgba(255,196,103,1). 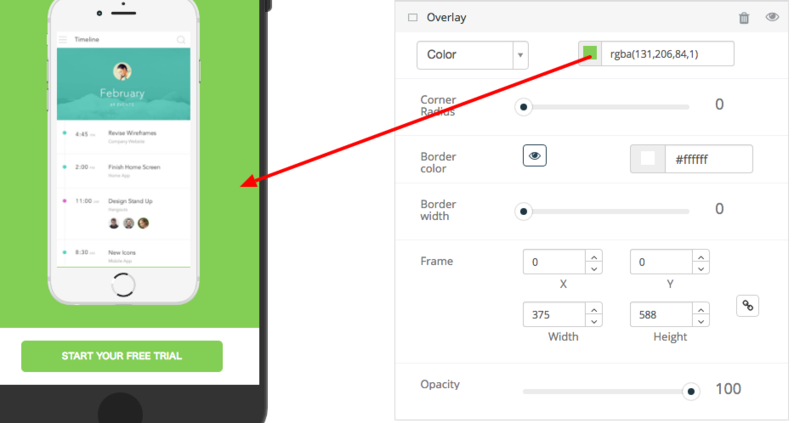 To choose the &apos;App Screen Mockups &apos; click on the &apos;Image Element &apos;. 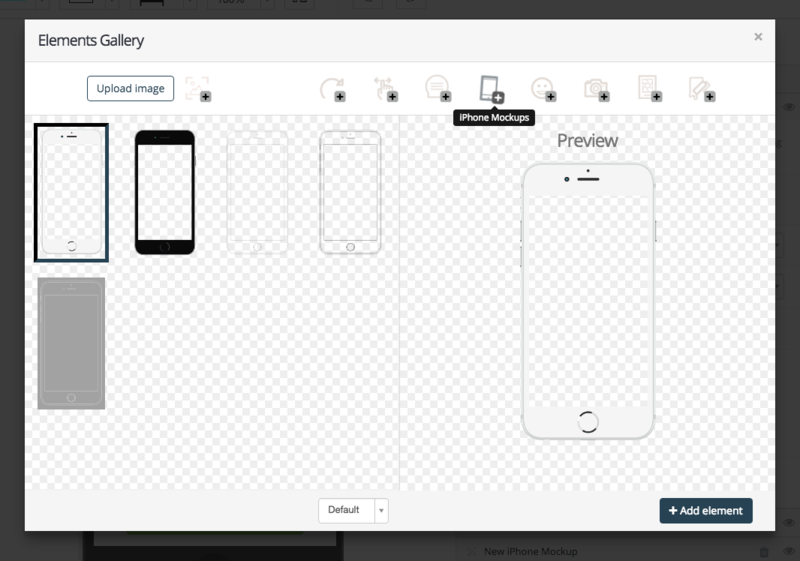 Hover over the &apos;App Screen Mockups&apos; and then choose which mockup you want to add to your screen. Lastly, click on &apos;Add element&apos;. Then the image will appear on the screen. The iPhone Mockup, which we labeled as New iPhone Mockup, was placed in front of the background. The iPhone is placed in the middle of the screen. 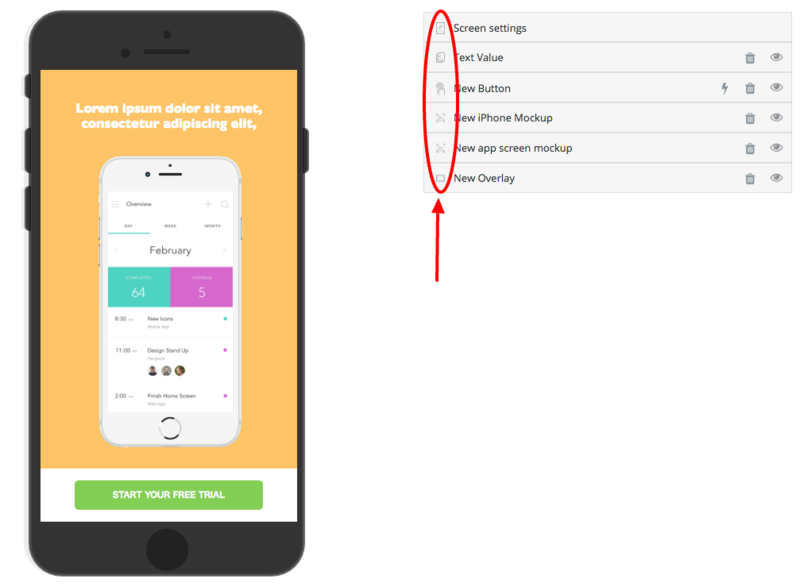 We also added a &apos;Call-To-Action Element ,&apos; New Button. We placed the button at the bottom of the screen. We clicked on to hide the indicator (it should appear like this ), so the swipe does not distract from the overall image. 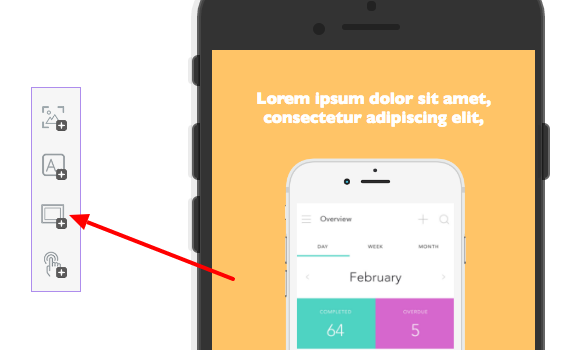 The Indicator means the pagination points (small dots) that usually appear along the screen. Screen Settings: You are only able to see the swipe dots once you have more than once screen. The Screen settings can be personalized to your liking. You are able to change the color, as well as hide the screen completely. Click here for an explanation. The &apos;Call-To-Action&apos; button has not been changed. The color overlay has a different color. You can just change the color by clicking on the color. The text in this screen is exactly the same from the previous screen. 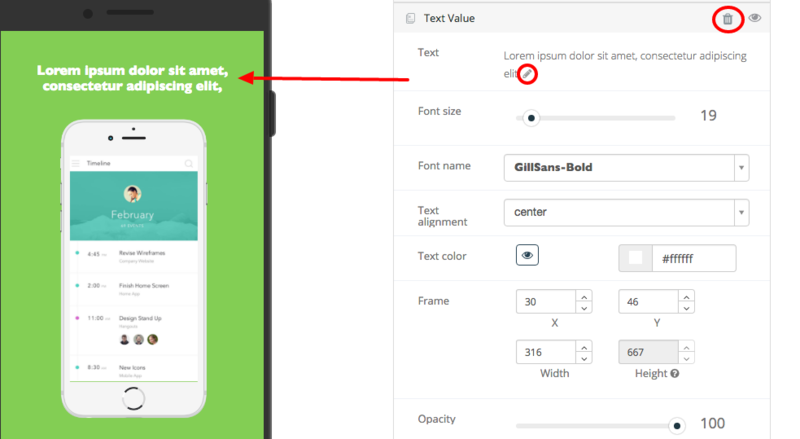 Changing the wording in the text element is very simple. To change the wording click on the &apos;text edit &apos; button. Write the new wording and then click on &apos; update&apos; to save the text. 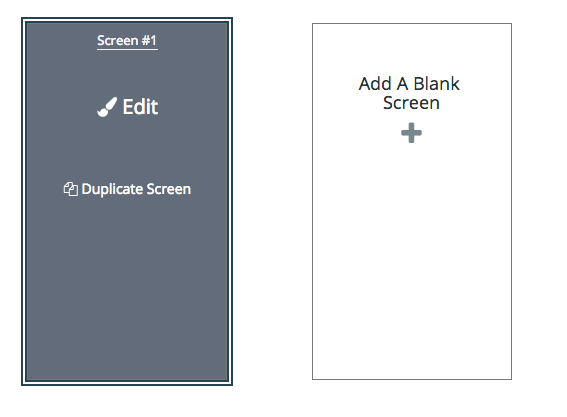 Screen 3 and Screen 4: can be created the same way as screen 1 and screen 2. 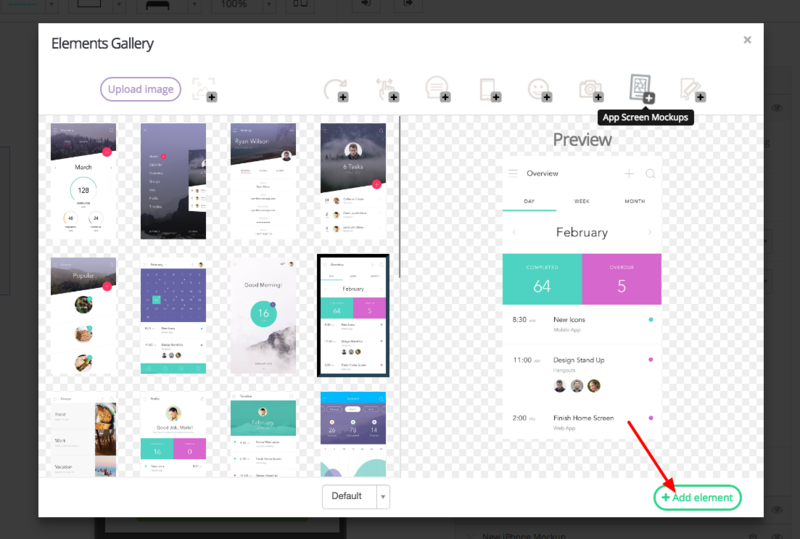 The only changes that need to be made are the color overlay and the new app screen mockup. Transitions: When you are finished with all your screens, begin to set the transitions, the flow between the screens. You will find these buttons, &apos;Transition Inbound&apos; and &apos;Transition Outbound&apos; , on the top of the screen. By clicking on one of these buttons, you will navigate to our transitions studio&apos;s platform. The transitions for this experience are very simple.